In a world full of turmoil, we all seek serenity and success - but have much difficulty finding them. Little do we know that the key is lying at our doorstep. Each week, we enter the Oasis of Shabbos – the paradise where we can discover happiness and peace. In this lively and refreshing book, the author shows us how all the multi-faceted aspects of Shabbos are really components of one magnificent edifice. All of Shabbos (the do’s, the don’ts, and much else) comes together in one wonderful experience. The results are unbelievable enjoyment in this World – and tremendous reward in the World to Come. 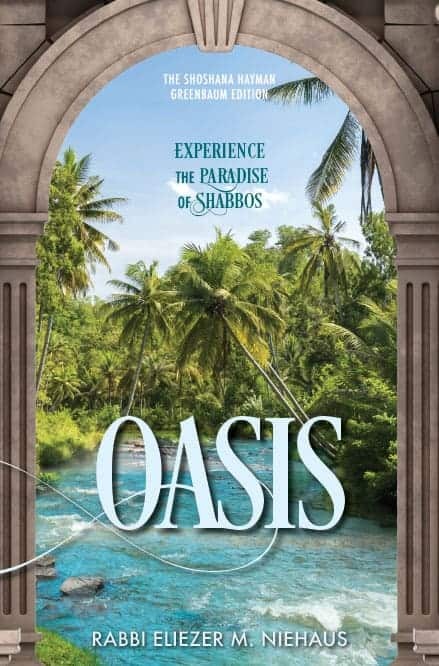 Join Rabbi Niehaus as we explore the Oasis of Shabbos and experience little-known but amazing hidden features of this most special day of the week – and our lives. This delightful and practical book helps take Shabbos from good to great!